Reboots. Cinema seems to be full of them lately. Some are necessary and some are unnecessary. It has probably got out of hand (look at the horror genre for example) but the big three franchise reboots of recent years - Batman, Star Trek, & James Bond - are of particular interest. Which one worked the best? The original series of Batman films, started by Tim Burton in 1989, left a few questions hanging in the air with their depiction of a reasonably mature Batman fighting crime with a minimum of backstory. Where in the name of Adam West did he learn how to be Batman? Who taught him martial arts? Where did he get his gadgets and car from? Does anyone secretly help him? Batman Begins, an excellent reboot/rethink of the franchise, answers these questions and establishes itself in the Premier League of comic book films. What is great about Batman Begins? The casting for starters. It was an inspired move to cast British actor Christian Bale as Wayne/Batman. Bale is a good actor and adds a bit of gravitas to the centre of the film. He's more than buff enough to fill the Batsuit and does a good job in separating the Wayne/Batman identities. He's refreshingly intimidating as Batman (Batman is supposed to scare criminals afterall) but often acts the drunken spoilt millionaire fool with Wayne. And yes, Bale is very James bond in some of the Bruce Wayne sequences. In real life Batman's identity would be rumbled in days but it was a nice touch to show that Batman at least uses his Bruce Wayne identity to make Wayne an unlikely person to be Batman in the eyes of Gotham. Liam Neeson is great as Ducard. I've sometimes found him a bit dull in other films but he spouts wonderful comic book gobbledygook with such seriousness here I must doff my cap to him. The respect for the comics and mythology of Batman is very evident throughout the film and the scenes with Ducart, with panoramic mountain views, give Batman Begins an ambition and scope beyond the patchy Batman films produced from 1989-1997. The second half of the film moves the action to Gotham and the production design, which is at times closer to Bladerunner than Tim Burton's gothic take on the character, is fantastic. There is also a spectacular and enjoyable chase involving the new Batmobile that gives Nolan a chance to flex his action muscles. I should add that Michael Caine is an absolute delight as Alfred and Cillian Murphy makes his mark as secondary villain Scarecrow. Batman Begins is crammed with terrific actors like Tom Wilkinson and Gary Oldman. Oldman, in a rare non-villain role, looks just like Jim Gordon from Frank Miller's Batman Year One, a graphic novel that provided a major part of the inspiration for Batman Begins. Morgan Freeman is as likeable as ever as Lucious Fox, an employee in a mysterious section of Wayne Enterprises who becomes an ally and is essentially Wayne's version of Q from the Bond films. Perhaps the only weak link is the bland Katie Holmes, a vague love interest for Bruce Wayne. Director Christopher Nolan, a brave choice at the time for Batman Begins, puts Batman into a more real world than the gothic/camp Batman films produced in the late eighties and early nineties and this effect is heightened by our fresh knowledge of how Batman came to be. The film has many striking images and makes good use of Scarecrow's mind-altering gas for some nightmarish effects. The climax is exciting and the relationship between Bruce Wayne and Alfred is deftly developed and touching. There is a lot of backstory to convey in Batman Begins and the film allows plenty of time to develop the emergence of Batman. Some might feel that there could have been a bit more action in the film but I think the big set-pieces, when they arrive, work better for being part of a restrained film that tries to give the audience some character development rather than shoehorn in too many popcorn stunts. The shaky cam and fast-editing, a bit like the Bourne films, is a bit overdone during some dimly lit fight scenes but Nolan, overall, must be commended for giving this fresh take on Batman a reasonably new feel, as far as one can in the Batman 'universe'. Batman Begins is in the top-tier of comic book films and was the best treatment of the character to reach the screen at the time. The second film in the Batman reboot, 2008's The Dark Knight, is a truly cinematic experience and pays off the viewer multiple times with new revelations and visually arresting set pieces. I think it probably raises the bar for all future blockbusters and is the most unique experience I have had in a cinema since being accidentally locked inside one with two friends after a screening of a Teenage Mutant Ninja Turtles film. The start of The Dark Knight finds Bruce Wayne (Christian Bale) still roaming the rooftops and streets of Gotham fighting crime as Batman but also starting to question his future. How much longer can he take the physical punishment that being Batman involves? Could he ever have an ordinary life? One problem I had with Tim Burton's two Batman films is they had a very studio bound atmosphere at times as a result of the gothic fantasy tone. They had some great stuff but were ultimately somehow less than the sum of their parts. Christopher's Nolan's Batman films are by contrast set in a city that we can more readily accept as a real place with real location work and many sequences in daylight. By throwing open the world that Batman lives in even more, The Dark Knight creates a more realistic tone and also makes the film look much bigger in scope. It is by far the biggest, darkest, and best Batman film yet made. The opening sequence has the Joker robbing a bank and already you see that Nolan has opened up the world he is operating in and know that the film will be much more of a sprawling epic than Batman Begins. Crime films were said to be a big influence on The Dark Knight and there are street scenes packed with extras that remind one of Michael Mann's Heat and some criminal/mob scenes that could be from a Mafia film. I suspect Nolan even drew inspiration from films like Magnolia that shuffle a big cast over a long story. Some evacuation scenes in the film reminded me of Die Hard With A Vengance in places, although that may just have been me, and Nolan, a James Bond fan, makes Bruce Wayne a very James Bondian character at times. Morgan Freeman's Lucious Fox character supplies Wayne with a dazzling amount of cool gadgets and technology to use in various inventive ways. It's ironic really that the Bond films ditched Q for being too silly whereas The Dark Knight - a sombre and well, dark, film - still uses the character in a clever way for its own ends. The Dark Knight also includes one of the best James Bond pre-credit sequences never made when Batman attempts to kidnap a Hong Kong criminal from a skyscraper and escape via a waiting plane. There are moments in this film that should have the viewer in awe. Some reviews of The Dark Knight had led me to believe that Christian Bale and Batman were a bit sidelined in this film by the villain. I didn't find that to be honest. I think casting Christian Bale - who is a bit of an old thesp - as Batman was a very clever move. He's very physical and gruff-voiced as Batman but also terrific as Bruce Wayne. His scenes with Michael Caine's Alfred are all a delight as is his quiet rapport with Morgan Freeman. In real life everyone would probably guess in a second that Wayne was Batman but when Bale acts the buffoon as Bruce Wayne as a ruse for people not to suspect he could be Batman you go along with it. Bale of course is also perfectly at home doing all the conflicted, tortured stuff. Heath Ledger has won numerous plaudits for his Joker and I have to say I think he deserves all of them. The Joker of the comics I read was often aristocratic and erudite. Jack Nicholson's Joker, though great fun, was played for laughs. This Joker, Ledger's Joker, is just a force of nature. A mad bomber terrifying everyone in the city. Ledger's Joker is scary because we know he doesn't care about anything except chaos. He isn't motivated by money. Ledger is compelling, strange and funny as the iconic villain. It's fair to say it will be difficult for anyone to ever top his take on this character in any future interpretation. The image of Ledger bounding away from the hospital as it explodes behind him is an especially memorable image in a film that has many. Another thing about the Joker here is that he isn't given some tiresome backstory like the villains in the previous Batman films. The fact that he's a bit vague and we never see him in a clinched villain HQ makes the character more enigmatic and frightening. He's just an unstoppable force loose somewhere. Aaron Eckhart, an excellent actor, pitches it just right as Harvey Dent. The point of the character is that he can go either way and the actor does a good job with his task as Harvey's patience is tested. Dent is neither too unrealistically brilliant or unlikeable when introduced, which is about right I think. Maggie Gyllenhaal is a distinct improvement over the wooden Katie Holmes as Rachael and actually has a bit of chemistry with her male co-stars, a rarity sometimes in these types of films. Gary Oldman is again perfect as Jim Gordon and has an expanded role in the film. Wherever you look The Dark Knight features interesting actors. 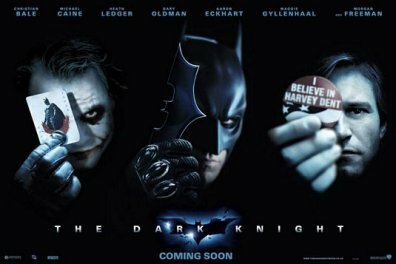 Is The Dark Knight a little pretentious? Probably, but I don't think it matters too much. You have to go for broke if you want to make the ultimate Batman epic - and this film is as close to that as anything is ever likely to be. I was surprised by how far they went to be honest. This is not a film for children and there are some surprisingly scary/violent moments for what is, I suppose, essentially a summer blockbuster, like Batman being attacked by dogs, and the Joker having a blade protrude from his shoes like Rosa Klebb before he kicks at Batman. It's a long way removed from the days of Joel Schumacher. In The Dark Knight, the kitchen sink is thrown at Gotham and Batman by the screenwriters and the villain. It's understandable that the film turned out to be even darker and longer than many expected. Dramatically though this is a strength of the film. It never sells itself out and is prepared to pull the rug away from the audience in a more daring way than you are used to with popular/comic book films. You do start to feel that anything can happen in this film after a while. I was knocked out by the look of The Dark Knight and the invention behind it. The Hong Kong sequence, the Batcycle on the streets of Gotham after a huge Batmobile chase. Incidentally, the Batcycle chase with the lorry seemed from the trailer to be the BIG end/climax to The Dark Knight. It's a measure of how huge and ambitious this film is that it's really just another set piece nowhere near the end of the film! The moment where Batman uses Sonar Vision later in the film is another brilliantly inventive idea and used wonderfully by Nolan and the FX team. There are countless moments or images from the film that made me smile in a geeky way. I honestly don't think a Batman fan could have asked for much more from The Dark Knight. With the growing trend for cinematic reboots - Batman, James Bond - it was only a matter of time I suppose until the ailing Star Trek franchise received a similar rebranding. The Next Generation run of films had long fizzled out to indifferent box-office numbers and Enterprise, the last television series, was axed after just four seasons, adding to a general feeling that Star Trek, as an overall product, had gradually disappeared up its own metaphorical black hole. Star Trek just hadn't been a big deal for a long time so in came JJ Abrams of Lost and Mission Impossible III fame, essentially charged with making the franchise lucrative and trendy, more mainstream and down with the kids. On the minus side, Abrams, who admits to not being a gigantic Star Trek fan in the past with vast swathes of the television output passing him by, tramples roughshod all over the loose continuity of the Star Trek universe (effectively creating an alternate history of his own) and parts of his approach are too action intensive and generic. On the plus side, the clever Abrams is a lot better at making films than the likes of Michael G Wilson and Barbara Broccoli and delivers a fast-paced, colourful and highly entertaining summer blockbuster that will appeal to many who don't usually watch Star Trek. 'Star Trek' dusts off that old oft-rumoured gambit of making a film about the young Kirk and Spock and the early days of the Starship Enterprise. It's an idea that works reasonably well here although a small part of me will probably always feel that it's slightly blasphemous to have new actors playing these iconic characters. The plot of the film revolves around Nero (Eric Bana), a nutty Romulan who is obsessed with revenge against the Federation and Spock for an event that occurred in the future. Nero travels back in time to the early days of Kirk and Spock where the freshly minted crew of the Enterprise find themselves battling to stop his plans to destroy Earth and Vulcan. There is a major event in this film which resets the Star Trek universe and essentially creates a new one. Are we in an alternate universe? Are there two different Enterprise crews? I know this is only a film and they wanted to free themselves from having to conform to Star Trek history too slavishly, but Abrams seems to erase the Star Trek canon here and it did bug me. "James T Kirk was considered to be a great man,"says Nero. "He went on to captain the USS Enterprise... but that was another life." The film begins with an attack on the USS kelvin by Nero's huge mining ship. The Kelvin contains the parents of James T Kirk, who we meet, and this sequence is both arresting and quite poignant, happily confirming that a sense of real scope and grandness is back in Star Trek. Our first introduction to Kirk though is not a promising one. He's about 10 years old and speeding along a dusty road in a sportscar and Back to the Future II jacket, being chased by a policeman on a hover cycle. We get dance music and blatant product placement too. Thankfully though, Star Trek essence returns for the excellent scenes featuring Spock as a boy on Vulcan, being teased by children for having a human mother and involved in some sort of enjoyably high-tech Vulcan school/test. Zachary Quinto is inspired casting as a younger, more uppity Spock, and certainly looks the part with his severe fringe and serious eyebrows. It's a credit to Quinto that you completely forget he's Sylar from Heroes and I got a big kick out of having him quote Sherlock Holmes at one point. Ben Cross is well cast too as Sarek in the film and I wish he'd had a few more scenes. "You will always be a child of two worlds," says Sarek to Spock. "And fully capable of deciding your own destiny. The question you face is, which path will you choose?" Kirk meanwhile, now older, is beaten up by Starfleet students after trying to chat-up the slinky Uhura (Zoe Saldaña) in a bar, but a meeting with Captain Pike (a well cast Bruce Greenwood) convinces him that Starfleet could be an option. In a rather contrived development, Kirk turns up to Starfleet a couple of days later as if he's just volunteered for five-a-side football practice or something. Luckily, Chris Pine, widely expected to be the possible weak link when casting was announced, is surprisingly good as Kirk and brings a playful quality that taps into Sir William of Shatner quite enjoyably at times. When Pine nonchalantly munches on an apple and dispatches comically unworried orders during the 'Kobayashi Maru' test you really start to see him becoming Captain Kirk. When the crew are more or less all in place, the film kicks into gear and never really relents. The only person here who seems to be doing a direct impersonation of his illustrious predecessor is Karl Urban as Leonard 'Bones' McCoy, but it's a great one as far as impersonations go and Urban sounds spookily like Deforest Kelly at times. "One tiny crack in the hull and our blood boils in thirteen seconds," says Bones meeting Kirk for the first time on a shuttle. "Solar flare might crop up, cook us in our seats. And wait till you're sitting pretty with a case of Andorian shingles, see if you're so relaxed when your eyeballs are bleeding. Space is disease and danger wrapped in darkness and silence!" John Cho doesn't have much to do as Sulu (disappointingly lacking George Takei's deep theatrical voice) and Anton Yelchin as Chekov reads out a lot of announcements in a a heavy comedy Russian accent. I didn't mind Yelchin but he did end up sounding like Frank Spencer to me somewhere along the line and I was sad to see that Walter Koenig's Davy Jones look had been abandoned! Elsewhere, Zoe Saldaña makes a perfectly fine Uhura although her role seemed to reduce as the film went on. I must say though, I'm not too sure about Simon Pegg as Scotty. Pegg basically affects a Scottish accent and acts whacky, looking rather less like the original actor/character than the rest of the cast. Pegg seems so excited to be in the film you fear for his blood pressure if they make another one. The design of the film is very impressive but Scotty's engine room is given a vague industrial look with plastic flap doors that makes it look more like the storage area of a small supermarket than the high-tech pulse of a Starship. What is great though is the addition of Leonard Nimoy as 'Spock Prime' in a role that, pleasantly, was more involved than the brief cameo I'd expected. He's a bit slower these days but Nimoy brings some welcome gravitas and calm into a film that is, just occasionally, a tad too frantic and loud (for Star Trek). The quieter moments, when they come, are rewarding, but you do wish there had been a few more of them. It's always a pleasure though to see Nimoy play this character onscreen and his brief encounter with the young Spock is worth the wait with a clever final line for Nimoy, subverting an old staple. It has almost become a cliche to say the villain was disappointing when reviewing a big popcorn film and Eric Bana isn't given the greatest baddie ever to leap off the page in Nero who, ironically, lacks the calculating menace of Tom Hardy's largely forgotten Praetor Shinzon, another Romulan villain from 2002's Star Trek: Nemesis. I did enjoy though Spock's wonderfully understated description of Nero as "A troubled Romulan." Star Trek is certainly a highly entertaining film and moves at a rapid velocity. I missed a bit of the old Star Trek 'sweep' and majesty - here, everything in space seems to be chaotic and claustrophobic with ships being shot upside down or something - and I do feel that some of the Star Trek essence has been sacrificed for a more generic action approach at times, but you would have to be a deeply miserable character to deny that this is a enjoyable rollercoaster ride that throws plenty of colour and spectacle at the screen. I don't recall my attention drifting at any point and there are countless little moments that will have any Star Trek fan smiling - like the little beeps and whooshes of the ship from the original series and the funky new transporter effects. The interactions between the cast are pretty good on the whole and you can see the bond between Kirk and Spock slowly starting to form after the early tension in their relationship. There is also a palpable spirit of adventure in the film at times with phaser battles and last minute transports etc, all up to speed. Overall, Star Trek accomplishes its reboot mission in making the brand more hip and mainstream. Despite my quibbles about certain elements - and I'm still not sure about the new 'timeline' - this is undeniably a superior summer blockbuster and a lavish film that is frequently a lot of fun. This has been covered a lot on the website so I thought I'd include some of my random thoughts on Casino Royale and Quantum of Solace taken from the reviews I wrote some time ago. The major problem with Casino Royale for this James Bond nerd was the casting of 38-year-old Daniel Craig as the 'young' Bond. The actor doesn't even look 38 in the film let alone 28. This contradiction was something that bugged me. Yes, they changed Bond's age to fit in with the casting on the official website and so on, but I was still left with the impression they were saying in this one Bond is a young whippersnapper on his first mission despite the fact that the actor playing him looks ancient compared to the other Bond actors in their first film! Daniel Craig is much better at the action than scenes where he has to display a lightness of touch. Your reaction to Casino Royale depends very much on your reaction to Daniel Craig. 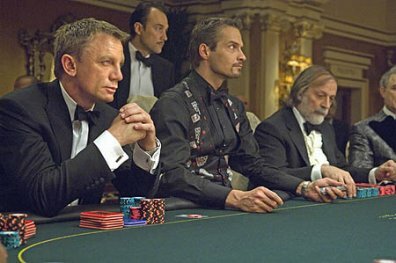 For me personally, the whole charm of the James Bond series was in the sophisticated handsome devil hero, a unique counter-point to the everyman heroes in vests and dirty shirts found in other films. This is lost with Daniel Craig and I found it disappointing that Eon could not have grounded the series with a younger actor who looked more like James Bond. If Craig's wrinkly mug represents Ian Fleming's James Bond then either the world has gone mad or I have. He falls short in projecting the urbane, refined qualities I always presumed were supposed to be part of the point - and fun - of James Bond. I liked the photography and the look of some of the film, especially towards the end, but Martin Campbell isn't my favourite director. Great at action, not so great with the static conventional scenes. Casino Royale does look suitably stylish in places. Like many Bond fans I found myself following the production of Casino Royale more closely than previous Bonds and for this reason the film didn't have any major surprises. Without this scrutiny on my part and with a different actor I might well have been much more enthusiastic. When I first heard about the plans for Casino Royale I pictured a young Bond, perhaps in the Royal Navy for a sequence. I was disappointed by how little the film lived up to my initial enthusiasm. The other thing that I wasn't really thrilled about was the whole 'pretend this is the first time you've ever met James Bond' aspect to the film. It sounded fun at first, the thought of finding out how specific tastes and talents became a part of his character. In the film it soon became slightly flimsy. Am I really meant to believe that a 38-year-old James Bond has to be taught about dinner-jackets by Vesper Lynd? The decision not to use the Bond theme, like the absence of Q and Moneypenny, I can understand, but it does all serve to make Casino Royale a strange experience. Some people like the changes but it all left me rather cold. I admire the attempt to throw the formula up in the air but I wasn't too convinced that it landed in the right place. The Bourne influence in Quantum Of Solace is very apparent. Indeed, there are three or four sequences that could have been lifted straight out that that rival spy series. A fight in a hotel room which, while striving to bring a brutal air into Bond, plays like a carbon copy of a scene in The Bourne Identity. A rooftop chase which is again cut in a very eccentric fashion and reminds one of The Bourne Ultimatum. I should point out as well that I was confused by parts of the film. Bond seemed to be constantly chasing or killing somebody and half the time I had no idea why. Even shots of Craig on a motorbike (going comically slowly) remind you of the amnesiac American spy. It's a matter of personal tastes but I find this rebooted Bond series is sliding into generic territory. The absurd decision not to use the famous James Bond music, apart from a few bars here and there, doesn't help the film either. It's not just Q and Moneypenny and the staples. It's the whole Bond experience and a modicum more wit, fun and charm. There are not enough witty lines in the film for any of the characters as the action continues to pile up. Quantum Of Solace is a strangely uninvolving film, rattling along with endless second-unit action. You sense that a better film was lost in a London editing room over the summer. Bits it of look good but it hardly delivers on the promise to evoke the look and feel of the great Ken Adam. And so to Bond himself, here again in the form of Daniel Craig looking like a has-been boxer who got punched in the face too many times. Some people like this direction, and good luck to Eon if they are carving out a new demographic, but I feel that Bond is in serious danger of becoming a one-dimensional bruiser. There is little of the panache of the Bond Fleming created here or the charm of the cinematic Bond. So overall, I wasn't greatly overwhelmed by Quantum Of Solace. Although it looks sleek at times, it's all surface slickness. It steams along with the earnest vacuity and hollow motivation of one of those Matrix sequels, all the while trying desperately to be Jason Bourne, with little or no story. The Batman Reboot 10/10 - Batman Begins looked at the origins of Batman and was a superior film. The Dark Knight was even better and enjoyably doffed its cap to (classic) Bond. The third film in the reboot is already highly anticipated. The James Bond Reboot 5/10 - Although highly praised, Casino Royale taught us nothing about the origins of Bond and seemed to be written for a younger actor than Daniel Craig who appeared a little long in the tooth to be a rookie agent. This reboot also loses points for its obsession with the Jason Bourne series of films. Quantum of Solace continued down this path and drew criticism for both this and eschewing the Bond staples and sense of fun. This reboot seems to have hit a blind alley already and will have to be rebooted itself before long. The Star Trek Reboot 7/10 - A good film although there was a slight whiff of 'Star Trek for people who don't like Star Trek' about this. Still, the reboot finally got the franchise back as a heavyweight box-office contender and it looks a good bet that the next film will do well too.